Without naming anyone, Mahajan took a dig at Congress president Rahul Gandhi, saying many leaders do not have knowledge about the samiti and tend to put forward incorrect views. "When I sit on the Speaker's chair, I think that all parties have their own politics. They have their own problems and they have their own leaders who must have directed the members of parliament to do something. I always try to make them understand." "My efforts had been always to run the house smoothly. If they still do not understand, then I would adjourn the house, call them inside my cabin, scold them or make them understand. I can also advise them. So that shows my great motherhood. I will not show my anger. This is also an example of balancing in the society," Mahajan said. 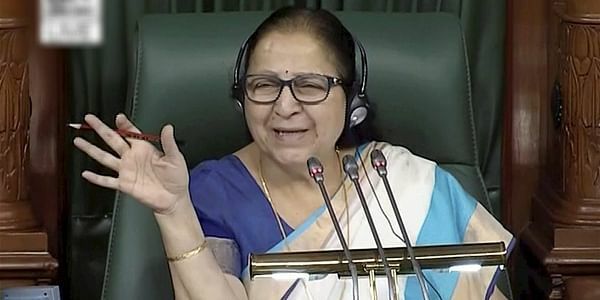 Her remarks came as the Monsoon Session of Parliament is set to begin on July 18. It will have nearly 18 sittings. The triple talaq bill, passed by Lok Sabha and pending in Rajya Sabha, will top government's agenda during the session. "I am a servant of this samiti. But since I am the Speaker, I cannot say it at any public gathering. I know that Laxmibai Kelkar had founded Rashtra Sevika Samiti only after taking inspiration from the Sangh. "(RSS founder K B) Hedgewar has said the Sangh can give everything to the Samiti but the work needs to be done by the women members. There is no need for women to join the RSS because there is Rashtra Sevika Samiti for them," she said. Mahajan said she had sent a book on the history of the samiti along with a letter to Gandhi "informing" him about the women wing of the Sangh. On October 10 last year, Gandhi alleged that the RSS discriminates against women. "How many women are there in the RSS? Have you ever seen any woman in 'shakhas' wearing shorts? I have never seen," he had said sarcastically during his address at a gathering of students in Vadodara in Gujarat. A day after his remarks, the RSS criticised Gandhi. RSS spokesperson Manmohan Vaidya said: "Asking about women in RSS shakhas is like trying to look for women in a men's hockey team. If someone wants to see women, he should go and watch a women's hockey match."